After three years of Nexyad products development, 2017 will see the start of mass deployment of its products. An Automotive EOM has integrated RoadNex & ObstaNex for road detection and obstacles detection on special vehicles and an Infrastructure EOM has integrated Visinex for visibility measurement on highways. Beside, we’ll soon announce our first customers for SafetyNex. Thanks to Business France, the DGE “Direction Générale des Entreprises” and “les Pôles de Compétitivité” (competitivity cluster) for having organised this CES mission. The “connected and autonomous vehicles” Mission brought together the four french pôles de compétitivité automobiles : LUTB, MOV’EO (Thanks too for the sponsoring), ID4CAR and cluster Pôle Véhicule du Futur; the Mission goal was to organise meetings and visits of big companies present at the CES and some top french Automotive SME’s in Las Vegas. Nexyad was part of the Mission and took the opportunity to meet its partners, customers and future customers in Las Vegas. The show is bigger than everybody has told us before. There is thousands of boothes in several places in Las Vegas. It is impossible to see everything in four days long. This year, French Tech was well represented in the Venetian Hotel and at the Convention Center near the Westgate Hotel. Thursday January 5th, Nexyad was invited to a networking reception sponsored by Orange with the presence of Mr Stéphane Richard, chairman and CEO of Orange. The event took place at the Air Bar on the top of the Strastosphere Tower in Las Vegas. Abeeway already present at CES 2015 presented this year its new solution for autonomous geolocalisation with great duration (one year). Giant Alphabet announced process of finalizing its autonomous car business through spin-off Waymo. Is Google will be car manufacturers or just embedded technology platforms and in the cloud technology for manufacturers ? The GENIVI industrial alliance provides an open source system initiative for automotive manufacturers and their suppliers in connected car field. It collaborates with the Open Connectivity Foundation for connectivity between vehicles and smart homes. The alliance includes manufacturers such as PSA60, Renault Nissan, BMW and Daimler. HERE Indoor Positioning brings precision to the industrial IoT. The NEXYAD team present in Las Vegas was invited by officials on the HERE booth at Convention Center Central Plazza. When we entered the booth, we saw a table with mini robotic forklifts in a warehouse, all built with real technology. The robots moved around a simulated environment picking up and delivering containers based on high-accuracy positioning, bringing the real-world applications to life. It was one of the numerous technologies presented by HERE at CES this year. LeddarTech has showcased three innovative 2D and 3D high-resolution LIDAR “solid state” solutions for autonomous driving applications based on next-generation LeddarCore ICs and developed with the collaboration of leading-edge suppliers and partners from the newly-established Leddar Ecosystem. Nexyad hat a “summit” meeting with Leddartech (top of the Westgate Hotel on the booth of the canadian company). Both companies spoke about various future projects within the Groupement ADAS. Gérard Yahiaoui CEO of Nexyad and Pier-Olivier Hamel Product leader at Leddartech. Quanergy Systems rised $90m in 2016 to built Autonomous cars sensors with US Partner Sensata Technologies. REVA2 participated for the first time to CES and present a vehicle that is both autonomous and traditional. It is in fact a complete automotive system that ambition to create the French startup. robotTUNER (An automated vehicle that looks like the french one NAVYA). Twinswheel has presented its autonomous droid for parcel delivery services in urban area. Valeo onboard demos area at Golden Lot was completely crowed during the four days of the Convention. But we were lucky happy few to test Valeo XtraVue and Valeo 360AEB Nearshield. Valeo XtraVue is a system based on a set of connected cameras that eliminates visual obstacles. It takes two vehicles equipped with the system. The driver of the vehicle B, which follows the vehicle A, can see on its control screen what happens in front of the vehicle A by seeing through it. Valeo 360AEB Nearshield (Autonomous Emergency Braking) is an innovative technology to protect nearby pedestrians when vehicles perform low-speed maneuvers. With a full 360 degrees system of cameras and ultrasonic sensors, this ADAS helps the driver to avoid accident due to blind spots around large vehicles such as SUV and pick-up trucks. Verizon (fixed and mobile telecom) was updating 2.0 of its Go90 video streaming application for iOS and Android which now supports Apple TV and Google Chromecast. It will allow the sharing of video links with other users via social networks. Verizon Digital Media acquired Volicon, which manages video distribution back-ends and analytics with its Media Intelligence Platform. Another acquisition is Fleetmatics for $ 2.4B. It is a fleet tracking service via GPS, a deal to get into the automotive sector. The sugar on the top was Yahoo !, acquired for only $ 4.8B. the top is its billion unique monthly users including 60% on mobiles, and its advertising network. This complements the acquisition of AOL, Yahoo being intended to integrate it. Visteon Demonstrates Augmented Reality Driving Experience and Latest Head-Up Display Technology at CES® 2017. Complementing the vehicle’s HUD, embedded front-view and driver monitoring cameras trigger “smart alerts” in the form of lights and sounds when the driver is not paying attention to the road, if the vehicle strays from its lane, or if the vehicle is at risk of potentially hitting an object. For example, when a pedestrian or bicycle is present on the side of the road, an LED light projects onto the windshield within a 90-degree angle of the driver’s line of sight, giving a visual alert without the driver needing to turn his or her head. detect obstacles and alerts the driver via a HUD. See below an example of Risk Profile Data Nexyad is able to give to their customers. SafetyNex provides Eco Driving profiles data, and usages profiles (Kms, date, hours, kind of roads, etc…) all of these can be crossed with Risk Profiles. Risk profiles estimated by SafetyNex: Analysis of profiles, and possible use to detect fatigue and hypovigilance of driver. SafetyNex is a nomadic real-time risk estimation system. The system has been described in detail in previous publications  and uses the key concept of “near-accident” or “quasi-accident”, and is a result of 15 years of collaborative research with road safety experts and researchers. to warn the driver (vocal alert), and thus to allow driver to avoid accident. Studies show that SafetyNex can reduce accident rate by 20% , which represents for insurers and fleet managers a consequent increase in margin . But of course, SafetyNex also records usage and risk profiles. These profiles provide the behavior of the driver, or more precisely, his/her ability to regulate driving task consistently with danger. No need to record large volumes of data (accelerations, etc…) which in reality are not data (these are signals) for a possible back-office analysis, SafetyNex provides exactly the interesting data . Below are examples of usage profiles and driver risk profiles. Last thursday 26th of january 2017, Gérard Yahiaoui CEO of Nexyad participated to a panel debate in Paris near Les Champs Elysées. He was invited as road safety telematics expert. Marie-Amélie Fenoll journalist at Decision Achats animated the discussion between other speakers : Jean-Yves Marie Rose of Ademe, Julien Honnart of Wayzup, Didier Blocus of ALD Automotive France, Edwin Colella and Alain Sinquin of Octo Telematics. Fleet Management faces numerous problems and stakes in terms of safety, monitoring of drivers, training and loss costs. 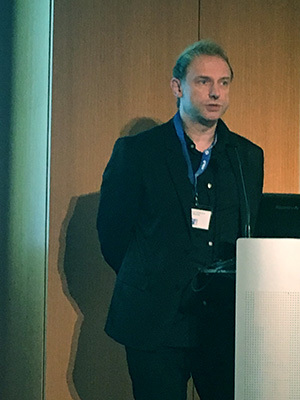 Gérard Yahiaoui presented SafetyNex App risk assessment in real time, that warns the driver before danger and gives individual and global risk profiles and usage profiles. An API of SafetyNex will be available very soon to integrate in any device. SafetyNex use allows to reduce accident rate by 20%. Les rencontres du Fleet Management partners are ALD Automotive France, Ayming, Codes Rousseau, La carte carburant pro E. Leclerc, Octo Telematics and Phoenix development. (PME championne du pôle de compétitivité MOV’EO). “We are very proud to get this award from MOV’EO that works hard for high tech SMEs development” said Gerard YAHIAOUI, CEO of NEXYAD. “We participated to the MOV’EO mission at CES 2017 in LasVegas, with Business France, and for us, it is already a success”. “This new award will give us more exposure and for a High-Tech SME it is always a good thing”. “Nous sommes très fiers d’obtenir cette récompense de MOV’EO qui œuvre pour le développement des PME de hautes technologies dans le secteur de la mobilité. Nous avons participé à la la mission CES 2017 à Las Vegas, avec Business France, et pour Nexyad, c’est déjà un succès. Cette nouvelle récompense nous apporte plus d’exposition et pour une PME de High-Tech c’est toujours une bonne chose.” a déclaré Gérard Yahiaoui le P-DG de Nexyad. General ergonomics of SafetyNex has changed and after each run you have immediate results of your driving score with Gold Cup if you are safe. RENAULT ZOE of Adaccess on Groupement ADAS booth at CESA Automotive 2016. Gérard Yahiaoui CEO of Nexyad and Jochen Langheim Vice President of ST microelectronics and Chairman of CESA Automotive 2016 on Groupement ADAS booth at CESA in Versailles. 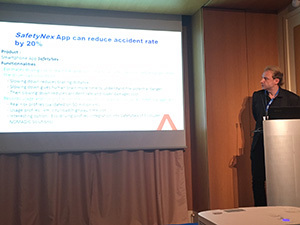 Gérard Yahiaoui CEO of Nexyad presented SafetyNex Real Time Onboard Driving Risk Assessment for Car Telematics at the Conference “Highly Automated Driving New Sensors” of CESA 2016 in Versailles. Groupement ADAS booth shows top technologies and competences of 9 companies dedicated to ADAS and sponsored by MOVEO.
. ADACCESS is a French engineering company specialized in embedded measurement and vehicle prototyping. Cluster “Groupement ADAS” Launched the october 18th first ADAS Morning co-organized with MOVEO in Paris. Thema was ADAS and Road Safety : to discuss challenges, solutions and opportunities with many specialists personalities in the field in front of a large audience. European and American car Insurance Companies are all currently testing onboard telematics systems (on professional electronics devices or on Smartphones), in order to study new opportunities provided by digital technologies in the evolution of their business and business models . We also can see now some experiments in Asia. Indeed, digitization of the economy has an impact on insurance industry too, as new competitors such as GAFAMs (Google, Amazon, Facebook, Apple, Microsoft) come to their car insurance market with new approaches, always ready to capture value. The main idea behind testing telematics is that it would be nice to adjust at best pricing of insurance depending on the driver. Onboard telematics is expected to « measure » usage (kind of road, day/night, number of km, et …) and to estimate risk taken by the driver. Friday, november 4th, at Automotive Techdays in Lyon (Rhône-Alpes), Vision System announced its new technology Smart-Vision. This ADAS innovation is fully developed by the firm from Brignais in partnership with Nexyad.
. When a vehicle, bicycle or pedestrian enters the blind spot area, each with a specific signal, regardless of the speed of the vehicle or the external environment.
. When they can safely change lane (for example, after overtaking). Smart-Vision reduces power/fuel consumption significantly, enhances ergonomics and improves safety. Both hardware and software are tailor-made by Vision Systems. Les passions se déchaînent autour de la question des véhicules autonomes, ou semi-autonomes. Récemment, une personne a perdu la vie dans son véhicule TESLA alors qu’il était en mode auto-pilote. NEXYAD a étudié la sécurité routière pendant une vingtaine d’année, et nous donnons quelques éléments de réflexion sur ce type d’accident. Les chaînes de traitement de l’information des systèmes auto-pilote, driverless, etc… allant de la perception de l’environnement jusqu’à la prise de décision et à la gestion automatique des actionneurs, sont généralement très bien conçues, et mettent en œuvre des modules performants. Mais cela ne suffit pas à rendre nul le risque d’accident. En effet, pour traiter ce risque, il manque une chaîne parallèle (et indépendante) de « monitoring ». C’est pour bien comprendre cette nécessité, il faut tout d’abord appréhender le niveau de complexité d’une scène routière vue par une caméra. the time for monitoring circuit has come. Processing circuit, informing auto-pilot systems, control, etc … from perception, data fusion, decision-making, and automatic control of actuators, are usually very well designed, and based on high-performance modules. But unfortunately, this is not enough to void the risk of accidents. Indeed, for the treatment of this risk, it lacks a parallel circuit (parallel and independent) called “monitoring” circuit. To understand this need for a monitoring circuit, one must first understand the level of complexity of a road scene viewed from a camera. The variability of road scenes is actually much more than what a normal person comes to imagine. Indeed, a color image, which has eight bits for each colors (then, 24-bit, as there are 3 colors) may encode 224 different color levels per pixel (more than 65,000 different possible values). HD video has more than 2 million pixels. This means that the matrix of HD 8-bit color image may encode more than 65 0002 000 000 images ! This huge number is simply unimaginable. Validation of camera-based artificial vision systems applied on open world is a very complex issue. An HD colour camera may generate more than 65 000 power 2 000 000 different images (information theory), so it is not possible to test every possible message. We propose a deterministic approach for building a validation database using the AGENDA methodology that was developed and published in the 1990s for neural network database (learn & test) design. A large audience attended to this conference that questions the way for Autonomous Vehicle ADAS validation. Gérard on the left, the conference’s audience on the top and the booth of Groupement ADAS from the mezzanine. Installation on Testing Expo 2016 for Autonomous Vehicle Test & Development Symposium is done ! We are waiting for Christophe Giannetti of GlobalSensing Technologies. With Nexyad these two companies are members of Groupement ADAS, SMEs cluster sponsorized by MOV’EO Imagine Mobility.